Throughout the year, Northern Michigan is the place to find fabulous festivals and special events. Based around history, the arts, outdoor activities and special celebrations such as the Venetian Festival in Charlevoix or the Mushroom Festival in Boyne City, Northern Michigan's many special events offer something for everyone. While many of the celebrations are in the warm weather months when so many visitors and summer residents are in Northern Michigan to enjoy all that we have to offer, don't miss some special events in the Ski Season such as Krazy Days at Boyne Highlands, Mardi Gras at Nub's Nob, and Carnival at Boyne Mountain, all in March. Click here for details on all that there is to see and do every month or scroll down for some of the most popular events that make Northern Michigan special. Crazy! Yes, that's March in Northern Michigan when the ski resorts celebrate the end of the ski season in style. Nub's Nob's Mardi Gras is an annual spring fling filled with zaniness. Boyne Highland's hosts Krazy Daze and Boyne Mountain celebrates with Carnival Weekend. Fun, fun! Click here for the March Calendar of Events. MorelFest If you love morels and love to hunt for morels, then Boyne City is the place for you in early May each year. With everything from food, to music, to morel hunting contests, to a carnival for the kids, Morel Fest is a great kick off to a spring and summer. Bike the 50 miles from the Boyne Highland's Zoo bar to Mackinac Island in the Zoo de Mack. In Mackinaw City, the Fort Michilimackinac Pageant at Colonial Michilimackinac includes a reenactment of the 1763 battle between French, Native Americans, and British, over the Memorial Day weekend. Click here for the May Calendar of Events. Petoskey celebrates with the Taste of the North June 15. In Water Boat Show June 14-15 in Bay Harbor celebrates boats and more. The Pig Roast takes place June 15-16 in Ellsworth. East Jordan's Freedom Festival includes family activities, fireworks, and a parade, June 26-30. Wolverine hosts the Lumberjack Festival June 21-23. Click here for the June Calendar of Events. National Cherry Festival in Traverse City is a week of celebrations surrounding the sweet and tart cherries. Nationally recognized as a summer treat! June 29-July 6. Harbor Springs July 4th Art Fair is held in Zorn Park and attracts artists from around the country. Blissfest Music Festival is a celebration of music, culture, art and community at the Festival Farm in picturesque rural northern Michigan July 12-14. 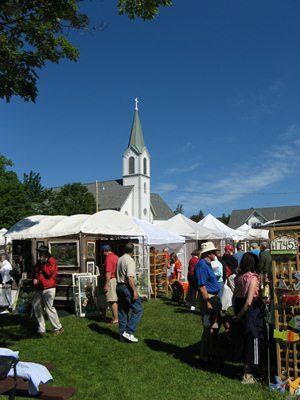 The Arts & Crafts Show in Charlevoix is unique because of the quality crafts exhibited. Visit the show July 13-14. Women's Club Art Fest hosted the Northern Michigan Women's Club is held at Nub's Nob on July 10. Venetian Festival in Charlevoix began 80+ years ago as a simple candle-lit boat parade and has grown into a week-long flurry of color and pageantry that highlights the summer season and attracts tens of thousands of visitors, July 20-27. For more information, visit Venetian Festival. Art in the Park in Petoskey's Pennsylvania Park has terrific art and includes a children's tent on July 20. Indian River Summerfest, July 18-21, includes a duck race, lobster roast, sport events, and more. Don't miss the Indian River SummerFest. Bay Harbor Art Festival is held in the waterside community of Bay Harbor on July 26-28. The Antique Flywheelers Show, July 26-28 has demonstrations, a petting zoo, music, dancing, and more. Click here for the July Calendar of Events. The Polish Festival in Boyne Falls is a northern Michigan tradition you don't want to miss. Polish food, Polish music, carnival, rodeo and lots of fun! Bring your polka shoes and plan on having a blast, August 2-4. Rendezvous in Mackinaw & 18th Century Trade Fair takes place August 1-4 in Mackinaw City. Charlevoix's Waterfront Art Fair is held August 10. Alanson Riverfest in Alanson is a weekend that includes an art/craft show, flea market, raffles, music and some new events this year, too! August 9-11. The Ironworkers Festival in Mackinaw City attracts ironworkers from across the US and Canada to compete in friendly competition. August 9-11. The Odawa Homecoming, August 10-11, features drumming, dancing, and music. Festival on the Bay on Petoskey's waterfront is filled with food, fun, entertainment and activities galore, August 15-17. Click here for the August Calendar of Events. So much to do in September! Walk across the Mackinac Bridge on Labor Day, September 2. Mackinaw City Beer & Wine Festival, September 7. Mackinaw City. Taste of Harbor Springs, September 21. Harbor Spring Festival of the Book September 27-29. Click here for the September Calendar of Events. Fall is perfect for fall foliage tours in Northern Michigan! Don't miss the Great Lakes Glass Pumpkin Patch kicks off October 5 in Harbor Springs and Cross Village and runs through November. Charlevoix loves apples and Apple Fest, the BEST celebration of the apple anywhere, October 11-13. Click here for the October Calendar of Events. The holiday season begins Up North with the Stafford's Holiday Parade in Petoskey and the Tree Lightings in Harbor Springs and Cross Village. A great way to get in the holiday spirit! Learn more here Holiday Celebrations in Northern Michigan. Click here for the November Calendar of Events. The Christmas holiday season Up North includes merchant open houses in Petoskey, Charlevoix, and Harbor Springs. Learn more here: Christmas Celebrations. Click here for the December Calendar of Events. The Martin Luther King weekend in mid-January brings skiers and snow lovers from around the midwest to celebrate in Northern Michigan. Learn more here: Martin Luther King Holiday Ski & Snow Weekend is a 3-day celebration of everything snow. January is the month for winter festivals with Mackinaw City's Winterfest and Indian River WinterFest. Click here for the January Calendar of Events. Petoskey celebrates winter with the Downtown Petoskey Winter Carnival, a week filled with food, fun and family events. Boyne City's WinterFest is combined with Chocolate Covered Boyne for a fun-filled weekend. Click here for the February Calendar of Events.